(Left) A parasol at work in Dupont Circle. Photo: Brooke Rosenblatt. (Right) Maurice Prendergast, Ponte della Paglia, 1898-99, completed 1922. Oil on canvas, 27 7/8 x 23 1/8 in. The Phillips Collection, Washington, D.C. Acquired 1922. 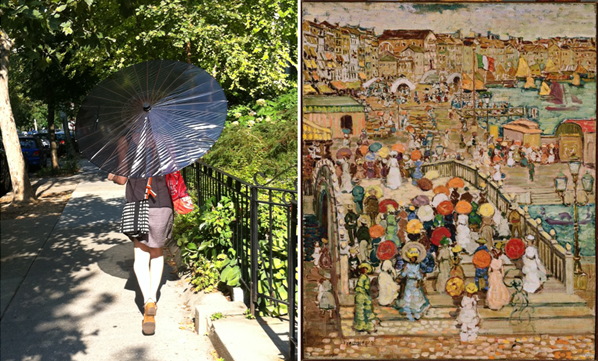 Walking home from work yesterday I fell in love with this parasol; I’m so glad they are making an encore. I couldn’t help but recall Maurice Prendergast’s Ponte della Paglia. While I might adopt the classic canopy to keep cool, I’m not sure I could ever weather their long dresses or corsets in this 90 degree heat! This entry was posted in Experiment Station and tagged Maurice Prendergast, parasols. Bookmark the permalink. What a great picture – good eye! And yes, I’m with you on those long dresses and corsets.